In Catholic Churches around the world, on Maundy Thursday, priests, bishops, cardinals, even the pope, wash the feet of members of the congregation in emulation of Jesus at the Last Supper. In some American churches foot washing is an integral part of every celebration of Holy Communion. This rite is a visual reenactment of the command to love and serve each other. 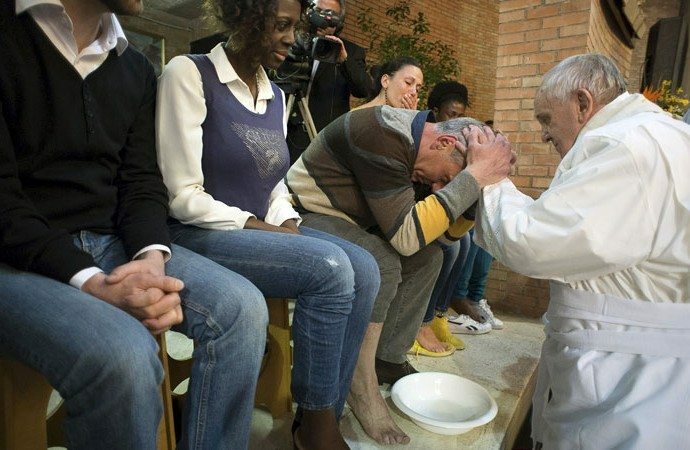 I suspect that Foot Washing isn’t an integral part of normal URC communion services though I suspect some may reenact this on Maundy Thursday. Yet the command to love and serve one another is something we should follow as disciples of the Lord. Foot Washing was a necessary task in a dusty country where open sandals are worn; what might contemporary Foot Washing consist of? Listening to those in mental pain; generously giving food to the food bank; inviting a destitute asylum seeker to share your home or any number of practical acts of love emulate our Master who washed his servants feet. showing love, humility and grace. and your saving love for all. The Rev’d Andy Braunston is minister of Barrhead, Shawlands and Stewarton URCs in the Southside Cluster in the Synod of Scotland. He also co-ordinates the URC Daily Devotions project.